This topic contains 14 replies, has 7 voices, and was last updated by sere83 3 months ago. I need some troubleshooting help with my mi notebook pro. It has 2 usb c ports and is able to power up my 4k 60hz acer monitor with the first port that is ALSO used for charging. The second usb c port will not work when connected to my monitor with the usb c to DP cable i have. Can anyone help? I dont want to keep disconnecting the monitor to charge the laptop for 2 hours…. Thanks to @unsurebutwilling on reddit, he provided a solution to your suffering, it’s not painless though. You need to get a xiaomi port adapter described here: xiaomi usb-c mini-display port adapter , which can be used to both charging and external screen simultaneously. Seems like it’s the only present solution to this problem. This is exactly the type of connection I was looking for in order to be able to charge the laptop while making edits on the 4K monitor. Thank you! Does anybody have an idea how to connect two 4K Monitors with 60hz to the xiaomi notebook pro? As far as I know only one of the two USB-Type C Ports can connect to a display. I already tried to connect two of the USB Type C to DP Adapters (one connected to the USB Type C Port of the other one) and on the two seperate USB-Type C Ports of the notebook with no success. Also I tried two different Displayport Splitter (Digitus & Startech) with the USB Type C to DP-Adapter with no success. I don’t have any further ideas. Can anybody help me? I have the Xiaomi adapter and I have plugged a mini display port to hdmi into in and it doesn’t seem to work. HDMI gets picked up straight away. I tested the display port to HDMI with my wifes MAC and that works fine. Seems like others have a similar problem, is this driver related? Hi all, have been chasing the same/similar issues. I’ve tried multiple hubs (unfortunately my xiaomi hub didnt work) and so far have found only one that actually works. Its this one: https://www.choetech.com/product/usb-c-to-hdmi-adapter-with-power-delivery-charging.html its a hdmi 4k60 out and one power port. This is the only thing that has ever succesfully let me use an hdmi port on my 4k screen and get 60hz instead of 30hz. Apparently it uses DP-alt mode and then converts it to hdmi 2.0 within the hub or some magic like that. So at least we know its physically possible.. However, I’m still searching for something that also has USB ports as I love the idea of one cable for everything. If anyone has found something like this please let me know. I might try to order another one of the xiaomi hubs, since my display does support dp as well, maybe the one i got was just busted..
small warning: do not buy Wofalo hubs, they specifically state they support 4k60, but actually dont. When I complained they only offered me a refund if I gave them a 5 star review on their misleading product lmao. Damn I already had a choetech adapter, but I didn’t thought about checking out for other adapters ! It’s cheap, I’ll grab one :). Hey guys, been following this thread. I bought he cheotech adaptor but it can only output at 4k30 to my monitor over hdmi. When i check setting it says it is using intel integrated 620 to output, is this correct? I have had problems displaying 60hz on my 4k monitor before using hdmi, so had to use the mini display port. If i get a mini display port to hdmi cable then connect to the cheotech that way do you think that would work? Honestly I’m not sure, you’d have to try it out. Are you sure the HDMI port on your display supports 4k60? My display only has two 4k60 ports and two 1080p ports, so it might be a specific port or your display might only support it through dp mini. And is your hdmi cable high speed? Some of the older HDMI cables dont support 4k60. On the Notbeook pro is it correct that it is using the onboard graphics not the mx150? According to benq that model should support 4k60 8bit over HDMI. Yeah I think it uses the onboard graphics by default, but for heavy graphics it should automatically switch to rendering on the mx150, similar to how the internal display works (as far as I know). 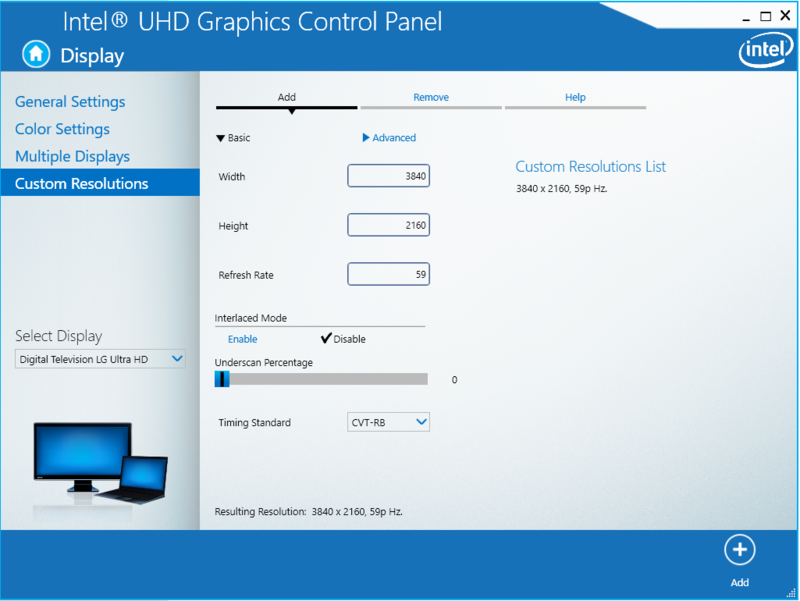 Now that you mention it, I remember I did have to make a custom resolution profile in the intel graphics control panel for my display specifically. I think it was with CVT-RB 3840×2160 and then try 60hz or 59hz if 60hz is buggy. The thing is when I try and output from the cheotech adapter to the HDMI of the monitor, 4k60 is not even an option. Which makes me think the HDMI’s on my monitor dont actually support 4k60 maybe? Or that i’m not using an HDMI 2.0 cable maybe? It is also not possible to get an hdmi to mini display port adaptor that works in that direction, it only works if you are outputting from a mini display port to an hdmi monitor, not the other way round. So not sure how this will work. Im sure it would work with a usb-c to mini display port cable but then i cant charge at the same time..
4k60 also wasn’t an option for me, thats why I had to make a custom resolution profile in intel graphics control panel. there you can add any resolution you want and any hz, it will just try whatever you put in. Make sure you select the right display & timing standard. I tried this but it didn’t work so then I contacted the manufacturer and figured out my monitor does not actually support HDMI 2.0 so 4k/60 over HDMI is not even possible, only 4k/30 is possible, so the only way to get 4K/60 is over mini display port. So what I think I need is actually this, which is basically the same as the other choetech HDMI adapter but supports mini display….